...to get started on your Christmas cards! Actually, now is a great time to get started. You won't be rushed and may actually complete your projects with plenty of time to, perhaps, enjoy the holiday season! The DSP is retired and, I'm sorry, I don't remember the name of it. 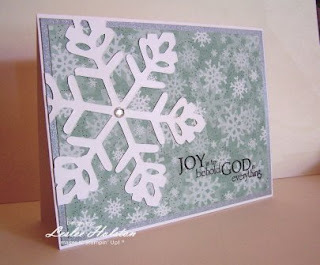 I thought that this would be a great layout to use up my snowflake papers and get lots of Christmas cards done at the same time. Of course, with this sentiment from the Wonderful Watercolor set, I can use this for a general winter-time card too. The sentiment is stamped in Basic Black craft ink. I think that the craft ink is much more vibrant and shows nicer than the classic. This uses retired DSP from the Wintergreen pack. I simply layered it onto a piece of Brushed Silver card stock. Both cards are on a Whisper White card base. The bling in the snowflake centers are Fashion Jewels that I've been hoarding for an extremely long time. I love the simplicity of these cards. The Big Shot makes it a very quick card to make. I will continue with this layout until all my snowflake papers are used up. I have an very long Christmas card list. Let me know how you like it. Comments are always welcome. Thanks for stopping by today! 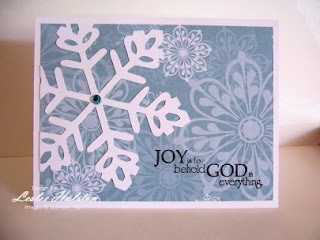 I hope you are inspired to get started on your holiday cards/projects.